Hugo Rocha of North Sails Spain recounts Olympics past and present, plus the tactics that got him through three editions of the Games in the Men’s 470, ultimately medaling in Atlanta, 1996. You were a young guy when you first went to Barcelona in 1992. Can you put into words what a first Olympic experience is like? The scale, the excitement, the camaraderie, etc. How did this affect you and what impact did it have? I have been a very big fan of sports since I was a little child. When I was eight I used to practice gymnastics and I remember watching on TV the Moscow’s Olympics Ceremony, and obviously being there was something unthinkable. At 10, I started sailing in the Optimist class, and by that time the idea of attending the Olympics was definitely on my mind. So when I finally could attend, my excitement was huge. Living in the Olympic Village, sharing the facilities with your sport idols, those whom you had seen only on TV, was an unforgettable experience. I still remember the inauguration day and the walk we did from the Village to the Stadium, I was astounded at how incredible everything was, surrounded by police, helicopters above us, like in the movies, I felt really important. Being there during the ceremony in the Stadium was a breathtaking and incredible experience. You must be extremely proud of your Bronze Medal in Atlanta (well, Savannah!) in 1996. Can you describe your emotions on the podium and the memories you now have looking back? Reaching your goal after 4 years of hard work represents an enormous joy. However, sailing in Savannah helped us to focus on the Olympic racing just as we would any other, since we stayed in the local Olympic Village which was far away from the hustle and bustle of the Olympic Games. For Atlanta, the real excitment came when we arrived in home in Portugal. A country with just a few Olympic medals, we had won two medals that year: Fernanda Ribeiro won gold in Women’s 10000mn, and us with bronze in the Men’s 470. Overnight, we became famous. Everybody stopped you on the street, the restaurants. Suddenly you felt a strange but nice pressure. From your three Olympic Games, other than the medal, what stands out from the different cities, teams and experiences that are all part of the world’s greatest sporting event? Barcelona was my first Olympic experience and I still remember some special moments like it was yesterday. I will never forget the image of Olympic flame cauldron being lit by a flaming arrow, and listening to the athlete’s oath of my friend Luis Doreste during the opening ceremony. In the Atlanta Games, sailing was hosted at a location far from the Olympic environment so it felt more like a common international competition rather than the biggest sporting event in the world. A curious thing was the giant platform where all the sailboats were standing, only accessible by boat. Everyday we had to take a 30 minutes ferry ride, enjoying the beautiful landscape. Sydney was the first time that I felt sailing was valued by the crowds, just as much as the other sports. It was amazing to see the great involvement of the city during the races. In fact, it was one of the few occasions that we could see such big crowds supporting a sailing event. The match racing finals in front of the Opera House had incredible and unprecedented participation from the public. Even today I ask myself why match racing does not have a place in the Olympic Games. I keep it along with all my trophies and sailing items in a personal work room. It is a minimum of 4 years with just one goal on your mind: winning the medal. Obviously it’s not an easy journey. The competitors are tough and all of them are struggling hard to reach the same reward. That’s why it is important to follow a methodology and, above all, to build your strength based on psychology which means that you have to work hard at what you believe, feel and want. Having a good team around you that can give support and advice is another key factor for success, because they must know you very well, giving you the confidence to destroy your fears. The level of competition at the Olympics is so strong in all fleets – with an experienced eye, what is your assessment of the Men’s 470 Class? Who are the top podium contenders? The 470 has always been a very strong Olympic Class both in the number of participants and the level of the athletes. In this Class, everyone struggles to get the best tuning and use the right materials to achieve the fastest boat. It is a very complete boat that requires a broad understanding of all tactics and technical items to compete on the top. 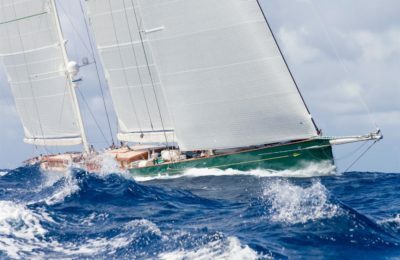 It is definitely an incredible boat and it will push you to become an experienced sailor. From my point of view, the top podium contenders are from Australia, Croatia, Argentina and Great Britain. How do you think the Class has changed since you raced? 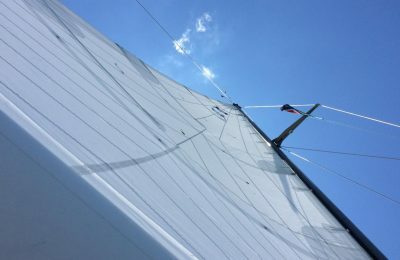 How have the sails also evolved to improve performance? During the last years, the class has faced several changes, the most important in my opinion is allowing the pumping from eight knots which demands a major physical effort. Regarding the evolution of the sails, I have seen important advances on the tuning guide directions, and the rake as well, besides a much flatter mainsail – especially on the bottom. Have you ever sailed in Rio? What do you make of the courses? The race area inside the bay is more tricky due to all the changes in pressure and currents. Outside the bay, there is a pretty nice course with good conditions and a nice swell. Finally, which country do you think will emerge at the top of the sailing medal table?